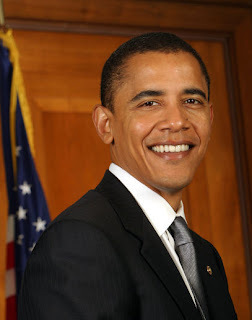 Barack Obama has been elected President of the United States of America!! Congratulations to Obama and Joe Biden and to all who have worked so hard during this campaign to make this happen. 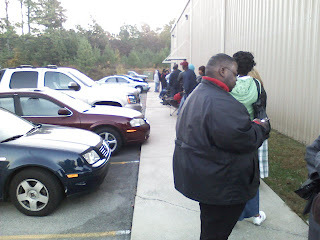 This was the view I had from my vantage point to the door of my polling place at 6:00 this morning. I waited for an hour in the cold. By the time the station opened at 7:00, the line consisted of close to 500 Trussvillites, and the line was growing longer and longer. After I signed in and bubbled in my selections, it was 7:20. At that time, there were probably 200-300 people inside the building waiting to pick up a ballot or filling one out, and another 400-500 outside the building. It was truly inspiring to see so many people exercising their right to vote so early in the morning. People are really ready for change this year. I don't know how things could be any better. Alabama is #1 in the nation and the nation is on the verge of electing Barack Obama as President!! Please, America, think about who you're voting for. A 9-year-old trick-or-treater wears a costume that lets people vote... with candy.